← Flash Fiction for #samplesunday – murder and mayhem, but who’s the villain? Since I’m working on a Fantasy novel now (and will be for some time), I thought I’d share this piece of flash fiction I wrote last year. I wrote it for the very first Visual Writing Prompt on Sojourner Mountain. The image comes from an incredible painting in the Louvre. I have no idea the title of the painting, or who painted it (sorry about that). But this corner of the painting captured my attention, so I snapped a photo of it. This bit of flash fiction may work its way into my WIP, SHADOWS AND BONES. I hope you enjoy it. 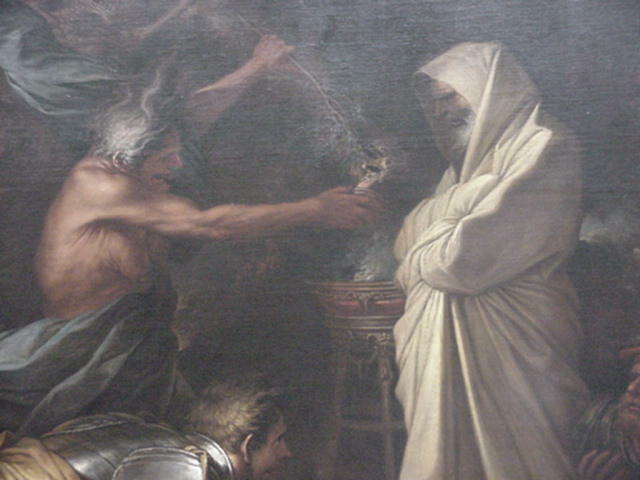 The prophet thrust the ancient flask to within a hand’s breadth of his King’s face. Rage flashed behind the sovereign’s eyes, and his countenance remained severe and stormy. “This is your reward!” the prophet declared. “Blood and loss!” The King reached out and took the ornate vessel, and silently regarded it. He then looked down on his youngest son, who remained kneeling. His armor was battered, and blood could be seen oozing from between the iron links on his left arm. “Speak,” said the King. The prophet stepped back, and the surviving prince stood. The King closed his eyes for a moment. When he opened them, they were as hard and resolved as the iron of his throne. “You will ride to the north and meet the enemy. You will not delay them. You will defeat them, or you will not come back.” The prophet laughed a disgusted, disdainful laugh. The Last Price stood. This entry was posted in Uncategorized and tagged fantasy, flash fiction, writing. Bookmark the permalink. Wonderful! I found you on Freshly Pressed. Look forward to more! Thank you very much for that! And thanks for mentioning Freshly Pressed. I’ve been meaning to learn more about it. Thanks again!